Applying waves' propagation modelling to the study of concrete damage. The in situ Non Destructive Evaluation by ultrasounds of a damaging on a civil engineering structure requires the mastery of ultrasonic waves' propagation phenomena in a very heterogeneous material. The waves-granulates and/or cracks interaction phenomena have to be taken into account in the waves' propagation equations. In the first place, we present works displaying the sensitivity of ultrasounds to the ageing of the concrete submitted to thermal stresses. Then we present the application of a multiscattering model to the case of concrete and we simulate its damaging by vacuums acting on the compression wave. On a specimen made of cement mixed with expanded polystyrene balls we carry out experimental checking of the validity of the concept. We propose solutions to simulate the case of concrete and tend towards an industrial application. Estimating the remaining life potential of a concrete structure is a recurrent issue. It implies implementing control over the material at different stages of its evolution. This material's pathologies are generally well identified [Gra96] and many techniques [Cor95], [Nea98] can be considered in order to bring them forward and estimate their importance. Non Destructive Testing meets this need for control and permits to saveguard the integrity of a structure during the analysis of its ageing. Acoustic wave propagation testing is resorted to under the form of echo impact, acoustic emission and ultrasonic waves. Crack detection is often carried out by the first two methods [Lin91]. Estimating a concrete's damaging more generally makes use of ultrasonic testing. The measurement of wave's velocity [Ber91] [Pop91] through a matter's volume and its correlation with the compression strength is a classical technique that can be applied to each concrete after a specific calibration campaign. These measurements can be performed on cores extracted from the structure. In this case, he specimen is only representative of a region with a limited and supposedly homogeneous size. A systematic in situ measurement is thus more rigorous, but the result is questionable because of the sensitivity of the waves propagating in the material, to a set of parameters such as temperature, humidity rate, components' nature and size, the stress applied, the measurements' frequency or segregation. In addition the access conditions may in industrial testing, limit the work from a single side. It is then clear that in situ damaging measurements on a concrete structure raise a number of questions that require an answer. [Ber91] studies the influence of the loading orientation on the crack closing and in the process on the waves' propagation velocity. Other studies offer some opportunities by exploiting different techniques or evaluation parameters. The attenuation of the transmitted [Hol02] or backscattered waves [Fue02], the spectrum degeneration [Gar00] [Gay92] or even the evolution of the signal energy [Ano01] are as many ultrasonic indicators that represent potentials in order to follow the damaging evolution. In the whole of these works, the prevision of the acoustic parameters evolution is rarely envisaged. The first objective of this work is thus to propose simple ultrasonic tests in order to put to the fore the amplitude of the variations of the compression waves' velocity in specimens presenting a controlled thermal damaging. The influence of the measurement frequency is taken into account. The second objective is to validate the possibility to model the propagation of an ultrasonic wave in the concrete by integrating multiscattering phenomena. A careful experimentation permits to validate this approach by simulating damaging by means of expanded polystyrene balls. The experimental and analytic results are very similar and show the potential of such an approach. Perspectives are developed as a conclusion on the in situ tests considered for the future works. In this first part, the objective is to put forward the importance of the velocity variations in front of the microstructure's evolution caused by thermal damaging. The microstructure's modifications and the strength decrease linked to an increase in the temperature are generally observed around 300 °C [Han02]. In case some silica smoke is added, this temperature may be lower and the value of 100 °C is commonplace [Saa96]. For our work, we have studied a high performance concrete with a 90 MPa compression strength. In an oven the specimens are submitted to a thermal stress limited to 200 °C. Up to this temperature there are no major microstructural modifications. Only some sulpha aluminates disappear and fibrous CSH appear in a limited amount already at 80 °C. The water vaporisation phenomena and the increase in the associated internal pressure as well as the paste-granulate differential dilatation are the main physical phenomena that lead to evenly distributed and isotropic microcracks. Microscopic observations have confirmed these hypotheses. It is important to record the damaging state by means of mechanical testing. The evolution of the ultrasonic waves can be compared with those of the compression strength (figure 1-A), of the elasticity modulus (figure 1-B), of the microcracks rate (figure 1-C) and of the density (figure 1-D). The different parameters are assessed according to the norms in force. The microcracks' rate corresponds to the number of cracks which intersect a 1 cm side spacing. The ultrasonic velocity is measured by transmission through Æ 110 * L 220 mm specimens. The coupling of the transducers is operated manually with a silicone gel. The time is determined at the point that first moves away by over 3 standard deviations from the statistical line deduced from the electronic noise. Fig 1: evolution of the ultrasonic waves velocity, of the compression strength, of the elasticity modulus, of the microcracks and of the density as a function of the temperature. What stands out from the results is the important amplitude of the ultrasonic waves' velocity variation in the face of the damaging suffered by the material. The state of the materiel is clearly estimated by the mechanical tests and confirmed by the rate of microcracks observed. Compression strength and elasticity modulus decreases are sizeable whereas the rate of microcracks only increases from 80 °C. The measurements of the longitudinal waves' velocity have been carried out thanks to different couples of transducers with nominal frequencies ranging from 24, 54, 100, 250, 500 and 1000 kHz. Figure 2 displays these results. It appears clearly that the measured velocity strongly evolves with the frequency whatever the damaging state. If the nominal frequency of the transducers increases then the velocity increases importantly too (around 10 %) before reaching a maximum and stabilizing around an asymptotic value. Fig 2: Ultrasonic wave's velocity evolution (OL) as a function of the frequency. It is worth noticing that concrete sizeably filters the high frequencies of ultrasonic signals all the more as the material is damaged. The values over 500 kHz are difficult to exploit with so large tested specimens. All these experimental results have shown the sensitivity of the indicator, i.e. the ultrasonic waves' velocity in front of the damaging problem. Exploiting this indicator requires the mastery over propagation phenomena in order to limit the calibration requirements necessary in the case of in situ testing. In the second part of this work we will partly provide an answer to the issue of the modelling and its experimental validation for this type of testing. Concrete is a very heterogeneous material. Each granulate can be considered as a scatterer. When the condition of frequency are met, it is in a position to scatter the wave in the matrix and thus to disrupt its propagation in the concrete. This disruption can modify the velocity and attenuation. In some cases, the wave becomes incoherent and loses its references as regards the initial time and its propagation direction. In the concrete, a part of the wave remains coherent. Three domains are determined depending on the wavelength compared with the granulate's dimension. Rayleigh's domain if l >> D the interaction between the scatterers is not taken into account and the coherent wave propagating in the medium is calculated as the wave's scattered part on each scatterer is disregarded [Fro82], [Gro92]. The scattering is simple. Stochastic domain if l " D the interaction between the scatterers has to be taken into account in the calculation of the coherent wave propagating in the medium. The scattering is multiple. Geometric domain if l << Dthe interactions are waves' reflection and refraction phenomena through the interfaces. The seismic domain is related to Rayleigh's domain. The domain of concrete testing could be in the Rayleigh's or stochastic domains. The stochastic domain is more interesting because the interactions between the wave and the scatterers are numerous. A clear duality is present between the importance of the scattering and the capability of a wave to penetrate the material. Fig 3: Multiple scattering principle. The higher the frequency, the more important the scattering on small scatterers such as microcracks. The scattering phenomenon is then easy to put forward but as it is considerable the wave rapidly loses its energy along its path. Several types of modelling allow to take this phenomenon into account in the propagation equations. It appears on experimental validation carried out on these models [Pou94], [Van00] among others, that performing models can be exploited in fluid media whose scatterers are spherical, either solid or fluid. Some models [Wat61], [Lax52] present realistic results for scatterers' densities able to reach 30 to 40 % according to the media. Some improvements on models are proposed [Tsa81], [Tsa82], [Var85]. The authors determine the equations of Lax's model all over the spectrum. [Eri95] introduces cracks into Foldy's model [Fol45]. The general principle consists in defining a homogeneous medium equivalent to that of concrete and with the same acoustic characteristics. The granulates and microcracks can be considered as scatterers with determined size, distribution and nature. Fig 4: Effective homogeneous medium equivalent to the heterogeneous one. where w is the wave's pulsation, Cp* the phase velocity and a * the scattering attenuation obtained for the compression ultrasonic wave propagating in the effective homogeneous medium. where k1 is the compression wave number in the matrix, f(0) and f(p) are respectively the forward and backward scattering amplitudes on a single obstacle. where Pn is the nth order Legendre's polynomial and An is the expansion coefficient calculated from matrix and obstacle acoustical properties. It is possible to determine the real and imaginary parts, according to (2), of the effective medium wave number. The effective phase velocity and attenuation are calculated according to the frequency for the coherent wave contribution. The damaging is taken into account analytically by the introduction of air spheres into a matrix of equivalent homogeneous concrete. The microcracks are a priori randomly oriented and distributed into the matrix. If we average out the scattering generated by all these cracks we can simulate it by the scattering of a set of identical spheres randomly distributed into the matrix. The size of the spheres is in the relation to the mean size of the cracks and the density of the spheres is related to the density of these cracks. The phase velocity as well as the attenuation of the homogeneous equivalent medium are deduced from the wave number k* obtained from the model proposed above. For a medium defined by table 1, the synthesis of the results is presented in figure 5. Studying the variations of densities d and spheres sizes a for different cases of frequencies [Cha02], puts to the fore that the amplitude of the velocity decrease is linked to the spheres' density. Moreover the frequency, for which a minimum of velocity appears, essentially depends on the spheres' radius. Fig 5: Velocity for 3 densities "d" of 1 mm radius air spheres and for 3 dimensions "a" of 30% density air spheres in concrete. The attenuation also shows a high sensitivity to the parameters representative of the damaging with an important increase in the value of the attenuation coefficient of the equivalent medium. Frequency here again plays a prominent role in the capacities of a simulated concrete to transmit a compression wave. Fig 6: Attenuation as a function of spheres' characteristics. The experimental work aims at validating the application of the homogenisation model to the case of concrete. In this perspective a "theoretical" specimen is realised. It is made of a cement matrix to which 30 % of 3 mm diameter polystyrene balls are added. The phase velocity and deduced attenuation are compared to the model's results for the same material. As the experimental measure had to lead to the Fourier transform of the signal in order to determine the phase velocity, the experimental device shows a particular conception. So as to respect the random character of the scatterers' distribution along the wave's path, we average out the ultrasonic signals taken at 16 different positions. The specimen's diameter is thus relevant. The divergence and scattering of the spectrum, observed on the wave's path into the specimen most of the time induce signals recorded by the lateral face's echoes. In order to keep clear of the problem we reduce the thickness of the specimen. The specimen's dimensions are 250 mm in diameter and 45 mm in length. Besides this small thickness limits the filtering effect on the ultrasonic signal by the concrete and allows to keep a large bandwidth after the propagation in the specimen. This calibration imposes rigorous coupling which justifies immersion tests. In addition these immersion tests permit to work in the far field zone. Eventually they allow an absolute measurement of the amplitude of the transmitted signal, independent from the coupling, which is essential to determine the attenuation coefficient. The specimens are kept in a state of water saturation so as to have command over the water content parameter. 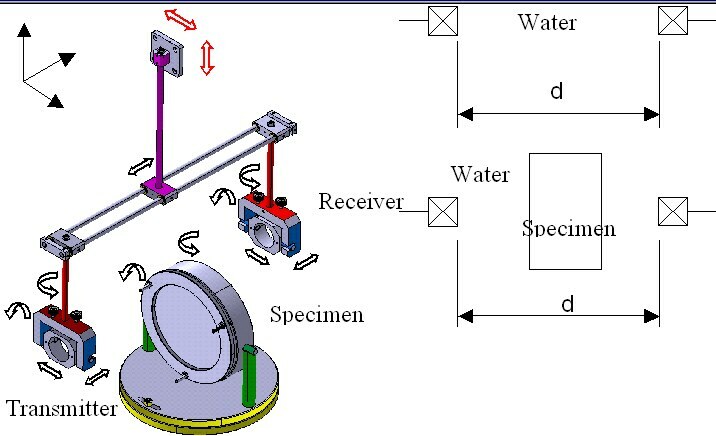 The immersed device proposed in figure 7 permits to work on a configuration without the specimen and on another with the tested specimen. The Fourier transforms of each averaged signal obtained in each configuration permit to determine the phase shift and the ratio of the signals' moduli. We determine the phase velocity and attenuation in relation to the frequency. The experimental curves presented in figure 8 have been obtained through three couples of transducers with nominal frequencies of 250 - 500 - 1000 kHz. Fig 8: Calculated and measured phase velocity of ultrasonic wave for a cement with 30% of polystyrene balls. The application of the model described above to the case of the tested specimen relies on the data (velocity 4320 m/s, attenuation, density 2145 kg/m3) measured on a pure cement matrix. The characteristics of the expanded polystyrene balls are close to those of the air. The comparison between the calculated and experimental curves shows a real agreement. This accordance is relevant on a 200 - 1400 kHz range. A divergence for low frequencies and some oscillations are probably attributable to the exploitation of experimental data. The uncertainty on the velocity measure is ± 50m/s. The velocity minimum to be observed for a 300 kHz frequency corresponds to the parameter of sensitivity to the size of the scatterers as stated above. This type of modelling thus allows to describe the propagation of a compression wave into a matrix made of cement mixed with polystyrene balls which are representative of the presence of a damaging in the concrete. The current work first consists in introducing air scatterers with variable sizes and varied shapes in order to near the description of a crack. It then aims at introducing solid scatterers in order to simulate granulates. Simply inverting the problem on the specimen has already proved to be feasible. An inversion strategy has to be defined in the face of the global problem. The Non Destructive Evaluation of concrete's damaging by ultrasounds requires the command over the waves' propagation in the material and their interaction with the cracks acting as scatterers. After having shown the sensitivity of the ultrasonic wave velocity facing the concrete's ageing, we have proposed to model the material and the wave's behaviour. Describing the phenomena of multiscattering and interaction of an ultrasonic wave with the scatterers in the case of a very heterogeneous material tends to prove its relevance. Its applications to the case of backscattered waves, which are a particular case of the scattering phenomenon, should allow the in situ Non Destructive Evaluation of the damaging of a civil engineering structure. Our future works aim at testing these solutions. [Ano01] P. Anugonda, J.S. Wiehn, J.A. Turner. Diffusion of ultrasound in concrete, Ultrasonics, Vol 39, 2001, pp. 429-435. [Ber91] Y. Berthaud., Damage measurements in concrete via an ultrasonic technique, Part I experiment, Cement and Concrete Research, Vol. 21, 1991, pp. 73-82. [Bri87] D. Brill, G. Gaunaurd, Resonance theory of elastic waves ultrasonically scattered from an elastic sphere, Journal of Acoustical Society of America, Vol. 81, 1987, pp. 1-21. [Cor95] G. Corneloup, V. Garnier, Etude bibliographique sur le contrôle non destructif des bétons, Rapport final du contrat CEA-SERAM n° 33420, 29 décembre 1995, 106 pages. [Eri95] A.S. Eriksson, A.Boström, S.K. Datta, Ultrasonic wave propagation through a cracked solid, Wave motion, Vol. 22, 1995, pp. 297-310. [Fol45] L. Foldy, The multiple scattering of waves, Physical Review, Vol. 67, No. 3 & 4, 1945, pp. 107-119. [Fue02] J.V. Fuente, L. Vergara, J. Gosalbez, R. Miralles, Time-Frequency analysis of ultrasonics backscattering noise dor nondestructive characterisation on cement pastes, 8th European Conference on Non Destructive Testing, June 17-21, Barcelona, In Proceedings, 2002. [Gar00] V. Garnier, G. Corneloup, E. Topani, M. Leygonie, Non destructive evaluation of concrete damage by ultrasounds, 15th World Conference on Non-Destructive Testing, Rome, In Proceedings, 2000. [Gay92] A. Gaydecki, F.M. Burdekin, W. Damaj, D.G. John, P.A.Payne, Propagation and attenuation of medium-frequency ultrasonic waves in concrete. A signal analytical Measurement Science & Technology, Vol. 3, No. 1, 1992, pp. 126-134. [Gra96] P.E. Grattan-Bellew, Microstructural investigation of deteriorated Portland cement concretes, Construction and Building Materials, Vol. 10, No. 1, 1996, pp. 3-16. [Han02] S.K. Handoo, S. Agarwal, S.K. Agarwal, Physicochemical, mineralogical, and morphological characteristics of concret exposed to elevated temperatures, Cement and Concrete Research, Vol. 32, 2002 pp. 1009-1018. [Lax52] M. Lax, Multiple scattering of waves. II. The effective field in dense systems, Physical Review, Vol. 85, 1952, pp. 621-629. [Lin91] Y. Lin, M. Sansalone, N.J. Carino, Impact-Echo response of concrete shafts, Geotechnical testing Journal, Vol. 14, No. 2, 1991, pp. 121-137. [Nea98] NEA/CSNI/R(98)6, Development priorities for non-destructive examination of concrete structures in nuclear plant, Nuclear Energy Agency, Organisation for Economic Co-operation and Development, 2 novembre1998, 62 pages. [Oul02] S. Ould Naffa, M. Gouygou, B. Piwakowski, F. Buyle-Bodin, Detection of chemical damage in concrete using ultrasound, Ultrasonic, article in press, 2002. [Pop91] S. Popovics, J.S. Popovics, Effect of stresses on the ultrasonic pulse velocity in concrete, Materials and Structures, Vol. 24, 1991, pp. 15-23. [Pou94] M.F. Poujol-Pfefer, Etude de la propagation acoustique dans un milieu inhomogène, application à la caractérisation des fonds sous-marin, Université d'Aix-Marseille II, Thèse de Doctorat, 1994, 160 pages. [Saa96] M. Saad, S.A. Abo-El-Eneim, G.B. Hanna, M.F. Kotkata, Effect of silica fume on the phase composition and microstructure of thermally treated concrete, Cement and Concrete Research, Vol. 26, No. 10, 1996, pp. 1479-1484. [Tsa81] L. Tsang, J.A. Kong, Multiple scattering of acoustic waves by a random distributions of discrete scatterers with the use of Quasicrytallie-Coherent Potential approximation, Journal of Applied Physics, Vol. 52, No. 9, 1981, pp. 5448-5458. [Tsa82] L. Tsang, J.A. Kong, T. Habashy, Multiple scattering of acoustic waves by random distribution of discrete spherical scatterers with the quasicrystalline and Percus-Yevick approximation, Journal of Acoustical Society of America, Vol. 71, 1982, pp. 552-558. [Var85] V.K. Varadan, Y. Ma, V.V. Varadan, A multiple scattering theory for elastic wave propagation in discrete random media, Journal of the Acoustical Society of America, Vol. 77, No. 2, 1985, pp. 375-385. [Wat61] P.C. Waterman, R. Truell, Multiple scattering of waves, Journal of Mathematical Physics, Vol. 2, No. 4, 1961, pp. 512-537.